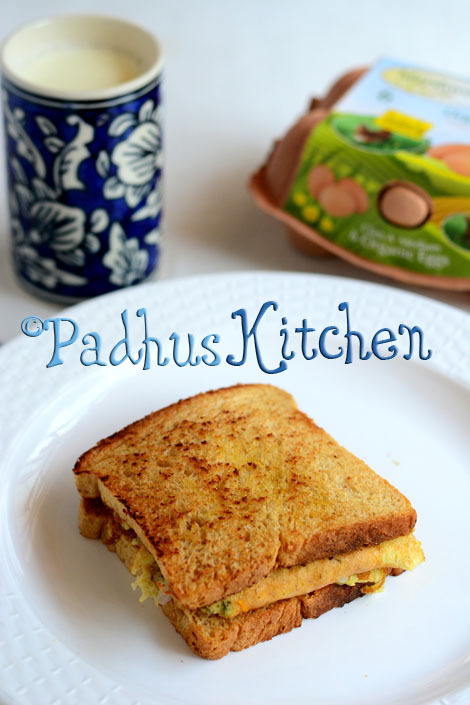 Omelette cheese sandwich is one of the easiest breakfast recipe that you can whip up in no time. It makes a filling breakfast or even lunch. It comes to your rescue when you are very hungry or run out of time. Today we will learn how to make an omelette sandwich following this easy recipe. Cut onions and green chillies finely. Toast bread with butter and keep it ready. Whisk together egg, 1 tbsp water, turmeric powder and salt. Add chopped onions, green chilli and grated cheese (I used Britannia cheese) to the egg mixture. Grease tawa with butter or oil and heat it. Once hot, add the egg mixture and cook on medium heat. When the egg begins to set, flip it over to the other side. Cook for 2-3 seconds, sprinkle pepper powder and fold it in half. Cut the half and place it between 2 toasted breads. Enjoy with tomato ketchup. Recipe is good but we don't eat eggs at home. Any way thanks for your hard work. Hi Padhu, can i use Cheddar cheese for this? If yes how do i store it...should i refrigerate it? I do not know many dishes with cheese as one of the ingredient so every time i get it and use in a dish, the rest of the portion is left out for mould growth in a very few days even if i refrigerate it. Yes, you can use cheddar cheese. Store it in the refrigerator. Wrap it in a parchment paper and then place it inside a plastic wrap.